The initial field visits for M4ID’s Core project were conducted this past spring, when research teams headed to Kenya, India, and Nigeria to gather findings about the sexual and reproductive health behaviours of women and girls. With the aim of co-designing optimal services per each unique setting, we conducted immersive interviews and group discussions to gain intergenerational perspectives on health matters. After the initial field research, the following phase was synthesising the findings. This process began for our team in a seemingly chaotic space widely covered by brightly-coloured post-it notes. 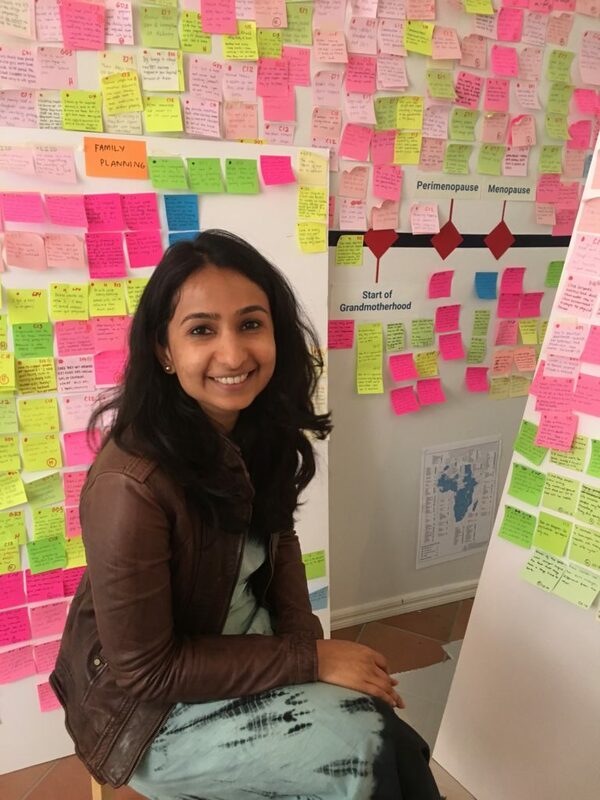 Design Research Lead, Priyam Sharda, explains the method – she tells us that the process of research synthesis involves first visualising everything that we learnt through post-its: these have been direct quotes from our transcripts, observations, or from our own notes. It then involves building thematic findings amongst these, through deep discussions among different members of the team and meticulously reviewing all the information we have at hand. “Everything is colour-coded, to make sense of it all,” Priyam explains. When asked about interesting findings, Priyam tells us that the initial observations have varied among each individual setting. For example, she tells us that men’s and women’s roles in advising young girls on their sexual and reproductive health varies among the cultures and communities. “For example, the mother and other women and girls in the family are expected to be the girls’ key influencers and advisors in Samastipur, India. In a Hausa-Muslim community in Lagos, however, a father or male family member may play the more central role,” she explains. The synthesis stage involves thoughtful reflection of our field findings, per each unique country. The next phase of the design research will begin this autumn when our teams travel back to India, Kenya, and Nigeria for another round of design research activities. The team will also commence the first field visit to Tanzania next month. Visualisation of M4ID’s design process from start to finish. focused largely on understanding the people for whom one is designing, i.e. the end users. To learn more about Core, please click here.